Samsung Galaxy SIII, iPhone 5, Flipkart, Toyota Prius!!! The first thing that comes to our minds on reading these words is –‘Technology’. So how do companies like Apple, Samsung and Toyota evolve with new trends which tend to surprise us every time? How do the who’s who of the geeky world manage the conception, design, product building and marketing of these masterpieces? Samvad brings you closer to finding the answers to all these questions. 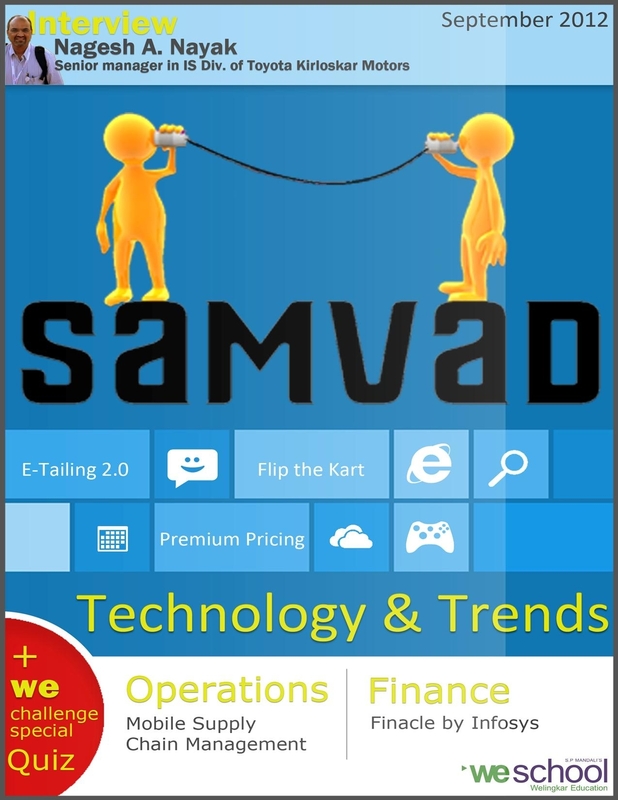 This month, Samvad brings to you it’s Eighth issue, ‘Technology and Trends’, which talks about the technologies used worldwide and the developing trends in the field. Our September issue brings along a special tête-à-tête with Mr. Nagesh A. Nayak, Senior Manager, IS Division, Toyota Kirloskar Motors. We hope that his insights on Technology and Leadership come of great benefits for all the readers. Each and every member of the team is in some or the other way dependent on technology. Thinking on similar lines, we at Samvad have decided to dedicate its September issue to Technology and Trends. Our writers have contributed a variety of articles related to Technology in the fields of Marketing, Human Resources, Operations and Finance. Our 8th issue features a wide range of articles like ‘Flip the Kart to Snap the Deal’, ‘Infosys and the Premium Pricing Conundrum’, ‘E Tailing 2.0’, ‘Corporate HR’ and so on. The Editor of Samvad(second from left) was at the “25 most powerful women in India”-award ceremony. 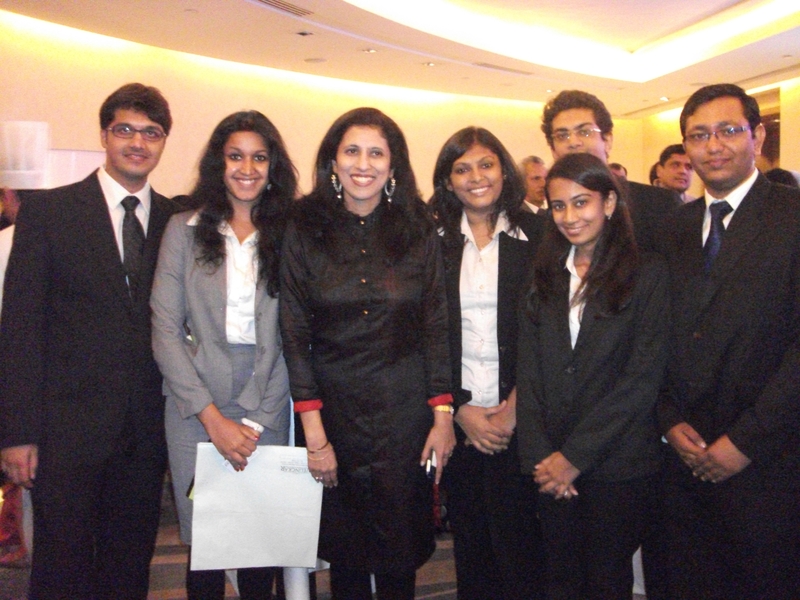 Ms. Leena Nair(third from left), the HR Head of HUL who was a recipient of the Most Powerful Women Award, Business Today shared her words of encouragement and wisdom towards Students of WeSchool and towards Samvad. This has added greatly to our motivation to work harder and better! The Samvad team has flourished in the past few months exceeding all expectations and has turned into a strong force to reckon with. Samvad has experienced a huge impetus in terms of readership for its last month’s issue on ‘Sports Management’. We have received an overwhelming response to the ‘WeChallenge’ competition in the September issue. We shall continue to explore many more fields in the further issues. We appreciate your contribution towards Samvad. To read the September Issue of Samvad, please click here. Keep reading and do write for us. Please send in your entries to samvad.we@gmail.com. Visit our Facebook page: Samvad: WeSchool Student Magazine, and Fb Samvad Group. Follow Samvad on twitter on @Samvad We. Do drop in with your feedback and comments.